Directly after finishing my degree I started working within the District Nursing team at Plymouth as a Band 5 Community Nurse. I love working in the community and getting to see patients in their own home is a real privilege. I spent nine months with the District Nursing team, a job I loved and felt very well supported in, but then my family and I relocated from Plymouth to Newcastle. At first I was worried that I would find it hard finding work in a new area, but thanks to the confidence and skills I gained at the University of Plymouth I was lucky enough to be offered all the jobs that I interviewed for. I now work for Marie Curie as part of the Rapid Response team. Following graduation, I was working as a Community Nurse in the District Nursing team. 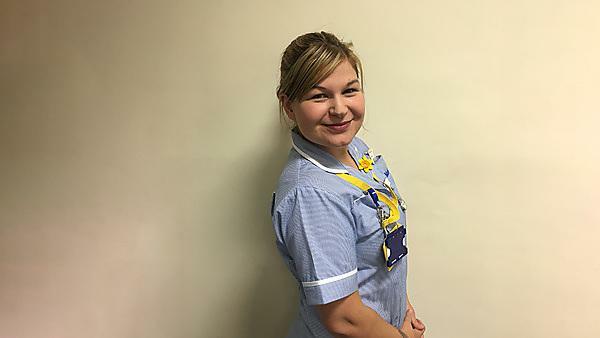 I have since moved to Newcastle and now work with the Marie Curie Rapid Response team, so my career path has changed from seeing a wide variety of conditions and wounds to a much more specialised type of nursing. I love being a nurse and take huge pride in my job! But there have definitely been challenges along the way: in my role as a Marie Curie Rapid Response Nurse I have found it challenging when patients have passed away during a visit and how best to communicate this with their family. Acquiring new skills and competencies is something I have always found very exciting. Even in palliative care, although we are dealing with some very heavy issues, we still have fun with our patients and the feeling when you have stopped someone being in pain, made them comfortable, and sat and talked with them and their relative is the best feeling ever. It is hard, especially with children, to get through and do the degree. But don’t let that put you off; it’s the kind of ‘hard’ that, at the time, if you keep your head down and get it done, when it’s all finished you wonder how you did it. And it is all absolutely completely worth it. Having my husband and kids at graduation was one of my proudest moments. For anyone who wants to work in palliative care or community care don’t be put off going straight in from graduation. My passion has always been community care and I’m so glad that it is where I started. The staff at Plymouth were fantastic and really encouraged us to always give our very best and hold very high standards. I felt totally supported all the way throughout my degree and when I needed extra support, due to unforeseen circumstances, they were brilliant. My favourite memories are of my friends and I all crammed into a small study room in the library, writing essays. We would spend hours together getting it done and learning from each other. My other favourite memory includes our very last lecture as a cohort: there was such a good atmosphere in the room and I’ll never forget it – and of course graduation. Yes, I made some lifelong friends during the degree: I couldn’t have gotten through it without them. And one of my lecturers has been my personal referee on all my job applications. I would recommend it to anyone; the staff are supportive and so knowledgeable on their subjects, and the balance of theory and placement meant that I had some fantastic experiences to put into practice what I had learnt during the theory sessions. Just enjoy it. At the time it may feel that you will never reach the end but it really is an amazing experience and there is nothing quite like it.